Before I began road tripping in Australia, I relished the idea of driving on long stretches of highway through the empty outback, the road in front of me like a shimmering oil slick streaking towards the horizon. I couldn’t wait to be in that enormous landscape, a tiny person in a tiny car with nothing but sand as far as the eye could see. That was until I drove north towards Port Hedland on the North West Coastal Highway. I nearly expired from boredom. Don’t ask me why, because I managed the road from Port Augusta to Coober Pedy without a problem and it was even longer and more monotonous than this one. Perhaps because by the time we were approaching Port Hedland we’d already been on the road for eight days? Maybe one week of red earth and stunted trees is the most I can handle. I was almost hoping a kangaroo would dive nose first in front of the car just to give me something to do. We were maybe about 30km away from the next rest stop and I couldn’t wait to get off the road and lie down for the night. Behind me in the mirror I could see the sun was setting. Ahead there was nothing but road and red, and a curious, glowing pink mound. Some kind of man-made construction, I thought, for its curved top was far too smooth to be natural. But then it began to rise up from the ground, gradually, like a hot air balloon, and I realised it was the moon, enormous and pink. 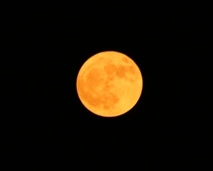 I have never seen anything like it before in my life, although Dave told me that the moon often appears magnified when it’s low on the horizon. Moments ago I had been so weary of the landscape, thinking that there was no more pleasure left for me in outback driving. Now, watching the moon rise and deflate and change in hue from pink to yellow, I felt as though I could stay on that road forever. Too soon we reached the rest stop and the moon went back to normal, a hard white disc in the sky. We were half way up the west coast when our campervan broke down. We tried to start it up one morning and it just wouldn’t go. Luckily it happened in Coral Bay where I had a good phone signal and there was a mechanic only half an hour away. But that wasn’t what was preventing the campervan from starting. The mechanic was stumped. He fished around inside the engine pulling out wires and looking for fuses. Eventually he left with assurances that he would be back once he’d got hold of a wiring diagram for our vehicle. We had been planning on spending a few hours snorkelling on the Ningaloo Reef but now we had the whole day at our disposal. Boy am I glad we had that extra time. It was amazing, like being inside a giant aquarium. 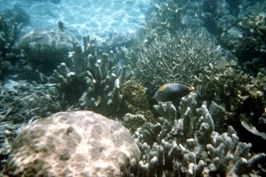 We swam through clouds of tiny, iridescent blue fish that floated up from coral towers. Pancake flat neon yellow fish, spiky lionfish and metallic green parrot fish flitted in and out of the reef, oblivious as we drifted on the surface of the water above them. In places the coral bloomed from the seabed like huge stone lettuces. Sometimes it was piled up like stacks of petrified firewood, or bulged into cratered domes like brains suspended in formaldehyde. Fish of all shapes, sizes and colours darted through their curious playground, wriggling into holes and diving under arches. We returned to the caravan park salt crusted and exhilarated shortly before the mechanic reappeared. This time he was able to find what was wrong with the engine and fix it. The next day we could continue with our adventure. The next morning we got up early and snuck quietly out of the parking bay where we had spent the night. That is, we got out as quietly as we could in our ancient, growling campervan. We refuelled and headed back to Geraldton, lesson learnt. After that, we always made sure we had plenty of fuel and water and I regularly texted my parents to update them on our itinerary. The following night we stayed in a 24 hour rest stop at the side of the highway. These rest stops are the best kind of free camping you can get on the west coast: you don’t have to stray off course to get to them, nor do you need a four wheel drive to access them. There are public toilets there and plenty of people around for company. We made it to Monkey Mia on our third day on the road. 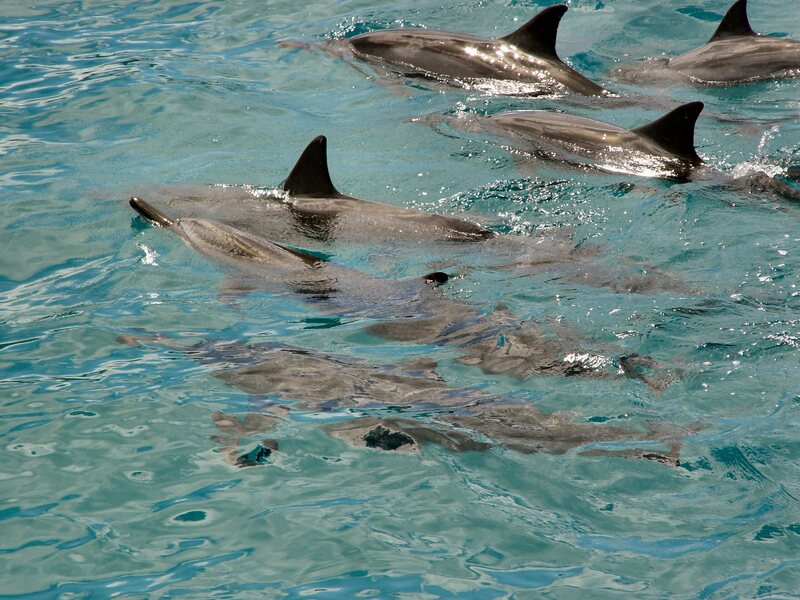 This is a beach resort where dolphins swim up to the shore three times a day to be fed by the rangers. The beach was also visited by pelicans and emus. Forget the spiders, forget the snakes. The praying mantis I found in the bathroom the other day has got to be the single most terrifying creature I have encountered in Australia so far. I thought it was a broken leaf lying on the floor and was about to pick it up when it rotated its heart shaped head towards me. Oh, the horror! What I had thought was the stem of a leaf was one of the mantis’ twiggy spriggy legs. I walked round it and its head swivelled to follow me. It was aware that I was there and it was watching me. Another insect, realising that a human was nearby, would have scuttled off into a dark corner of the room by now. It gave me the creeps. I coaxed it into a bucket and nudged the bucket out the front door with my foot. I got the bucket right to the far end of the veranda then I kicked it over and ran like hell back to the house. 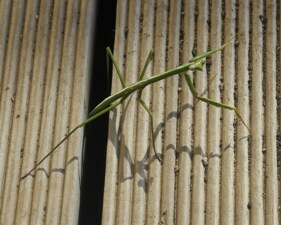 The next morning the mantis was sitting by the front door like a faithful dog. It counted us out of the house with a shake of its head. What really got to me was that it seemed so horribly intelligent. Insects are already superior to humans in many ways: they have three times as many legs, can carry a thousand times their own weight on their backs and can survive nuclear bombs. If their brains were just a little bigger they’d be good contenders to take over the world. I wondered if it was plotting something. Somewhere deep in my memory two long disused synapses sparked: didn’t praying mantises bite off people’s heads?! Just for a moment I forgot that our praying mantis was the size of a hair pin and that I could crush it easily under the heel of my boot if I wanted to. All I had in my head was this vision of a giant carnivorous insect with slavering jaws which I couldn’t quite connect to any real experience or science lesson or wildlife documentary. It was a moment of cold panic, until I realised that I was thinking of an episode of Buffy the Vampire Slayer, the one where Xander has a crush on a beautiful new teacher who turns out to be a praying mantis type monster in human disguise. Well, I felt a little foolish I can tell you, but also relieved. The praying mantis looked fairly revolting to me but at least it was probably harmless. And it didn’t stick around for very long; that evening when we got home from work it was gone. I’ve been putting up with the burst seam on my rucksack for years. It’s the only piece of luggage I take if I go away for a long weekend and every time I stow it into an overhead luggage rack, I say a little prayer that this won’t be the time that it explodes and showers the other passengers with my balled-up knickers. My big backpack is also falling apart. I only just bought it before I came here and already a metal rod has worked itself loose and speared through the strap so that it jabs me in the bum when I walk. I’m not very impressed with the design. It’s got all these fancy features that are supposed to make it suitable for mountain hiking and it can’t even withstand a few weeks propped up in the corner of a youth hostel dorm. At least I got a good bit of wear out of my sandals before the stitching on one of the straps came undone. I’ve been putting up with that for a while too. When you travel, you just have to put up with some things. I kept wearing my jeans until the hole in the knee became so advanced that the lower leg nearly dropped right off. The final straw was when the button popped off my denim skirt. I marched into Lincraft to buy a needle and thread and that was where I saw the flyer advertising a yarn bombing workshop. A yarn bombing workshop! Can you believe it? So yarn bombing is no longer considered to be an illicit activity carried out only under the cover of darkness, but a worthwhile pursuit that is accessible to everyone. I signed myself up and went along to City Square a few weekends ago for the workshop, which was run by Melbourne based yarn bombing collective, Yarn Corner. 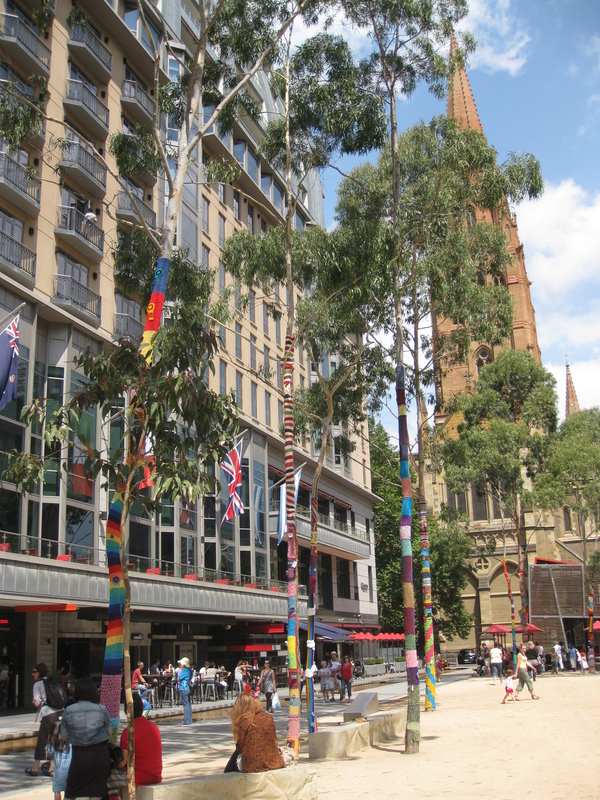 The previous day Yarn Corner had stitched up the trees in City Square in brightly coloured yarn bombs (with permission from the council) and the workshop took place under a canopy surrounded by these beautifully decorated trees. The ladies from Yarn Corner were so generous with their time and materials: they taught us how to knit and crochet and gave workshop attendees a free goody bag containing all the tools of the trade. They also shared their tips for successful yarn bombing. 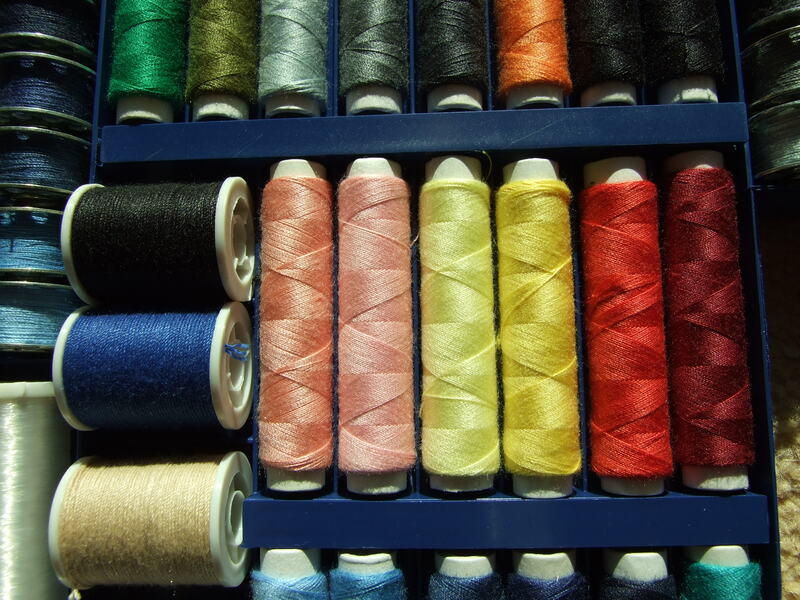 For example, measure the object you want to yarn bomb before you start knitting. Doh! 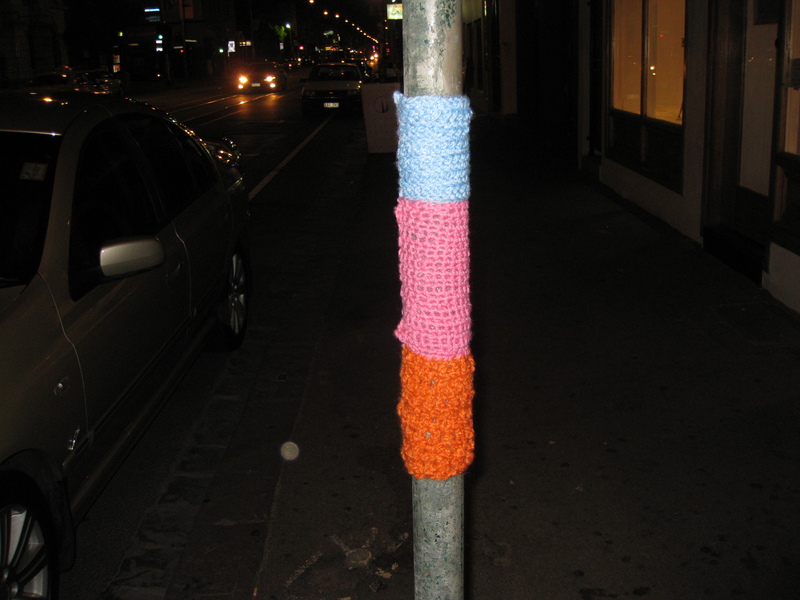 Go out in pairs to put up your work – as well as having moral support, one person can hold the yarn bomb in place while another person stitches it up. Photograph your work immediately because if you leave and come back later to take a photo, it might be gone. If your work does disappear, don’t get too disheartened because you don’t know who’s taken it and why.